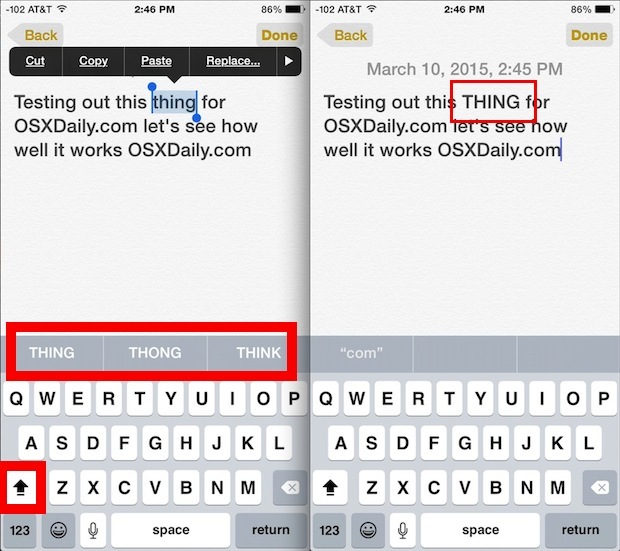 The shift and caps lock key in iOS can be toggled at will to either capitalize a word or to type out something in ALL CAPS, but using the new Quick Type keyboard, you can switch casing of existing words very easily. This works really well on the iPhone and iPad, and once you learn how to use this, it’ll probably become your preferred way to capitalize a word that has already been typed out, or to switch the casing to all upper or lower case. QuickType makes typing faster in general on the iPhone and iPad touch screen keyboards, and replacing the casing or capitalization is no exception. Once you get the hang of this you’ll find it to be so much faster than either flipping the caps key on with the iOS keyboard, or going back and trying to replace the first letter of a word to adjust capitalization, or, the least efficient of all, going back to delete a word and then retype it with the different casing. This nifty trick was found by LifeHacker. Handy tip, never knew about this. Why when I type QuickType the app that comes up does not resemble the app I read about here. I believe this is a feature of iOS 8, not a separate App (I’m still using iOS 7 so cannot confirm). Glad you enjoyed the tip Robert! PS: Thanks for offering corrections, that’s a big help for proofreading work which is inadequately infused with coffee. @Rusty …. It is not an app. It is built into the regular keyboard on your iPad and iPhone. Just start a new email to test it out. Make sure your predictive keyboard is showing. Hold down smiley face and turn on Predictive. You must have the newer iOS for this to be there. Good luck. I’ve just downloaded ‘Typiora’, a keyboard extension app that has ‘TextCase Control’ to do this task a lot faster.